Dutch Guilder Gold Coins are an excellent choice for collectors and investors. Investors can boost their portfolios with coins that contain 90% fine gold, while collectors will enjoy owning some of Europe's most important historical coins. Plus, Guilders are exceedingly rare and command high prices when re-sold. The Guilder was the currency of The Netherlands from the 17th century until 2003. The Royal Dutch Mint stopped producing both the Gold Guilder Coin in 1933. Coin Invest is delighted to stock a range of Gold Guilders that included the rarer "Dutch King" coins that were minted during the reign of Willem III from 1875 to 1890 and the more widely known Queen Wilhelmina Guilders that were issued between 1911 and 1933. Explore the entire range of Dutch Guilder Gold Coins at coininvest.com! The Dutch Guilder bullion coins contain a 90% pure gold and represent a great investment. Their historical importance and numismatic value make them a highly sought after commodity by coin collectors, and given there rarity can fetch significant prices. To add this precious coin to your investment portfolio add the item to your cart now whilst stocks last. You can buy Dutch guilder gold bullion coins from the CoinInvest online store by clicking on the image above. This will take you into the product description page where you can learn more about the fascinating history of these coins and add to your cart by clicking in the button highlighted by the orange band. Once you have selected the country you would like the product sending to feel free to continue our online store or proceed to checkout. Gold Guilder were circulation coins issuedby the Royal Dutch Mint for the Kingdom of the Netherlands until 1933 when production was discontinued together with the Gold Sovereign. The Dutch guilder was the currency of the Netherlands from the 17th century until 2002 when it was replaced by the euro. In the long years of the country’s history, a large variety of gold coins of different weights and sizes were issued. In fact, some coins have more than one name, thus guilders are also referred to as gulden or florins in Dutch. Gold coins with a 90% purity and a face of value of 10 guilders were issued from 1875 (with a unique design for that year) to 1889 under the reign of Willem III. "Dutch Kings", as these brilliant coins are known, can be a lot more difficult to obtain than the better-known Queen Wilhelmina 10 Guilder gold coins, though high-end brilliant uncirculated specimens show up from time to time – and fetch great prices. King Willem III was a ruler known for his despotic tendencies and was referred to by England's Queen Victoria as the "uneducated farmer". He died in 1890 leaving the throne to his precocious daughter, Wilhelmina. During her long reign from 1890 to 1948, Queen Wilhelmina issued four different versions of gold 10 Guilder coins. Most coin designs continued for a number of years, but there are also some that, for a variety of reasons, were only issued for one single year. The 1875 version is one such single-year issue, and thus highly sought after. 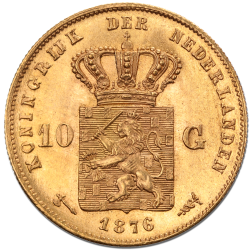 It was the first year that 10 Gulden gold coins were issued for Willem III, and they continued for another 13 years with a different design. Any investor would love to add a single-date design coin to their collections, and demand for such coins increases the price considerably. There were also 1 guilder coins (.750 gold purity) and 5, 10 and 20 guilder denominations made of 90% pure gold. As coins were struck in millions (with a few exceptions) the Royal Dutch Mint’s gold coin with a face value of 10 Guilders is the most popular investment in gold bullion Guilder, bearing exquisite designs, supreme manufacturing quality and, depending on the rarity, the condition and the year of issue, a significant historic and commemorative value. In 2001, the Royal Dutch Mint issued the last 1 guilder coin in a gold proof versionbefore the introduction to the Euro. The Queen Wilhelmina 10 Gulden gold bullion coin is 22 mm in diameter, 1.3 mm thick and weighs 6.729 gr. of 90% pure gold. The obverse of the first issue shows a long portrait of Queen Wilhelmina facing right, with draped shoulders and a coronet which reaches to the border, interrupting the inscription KONINGEN WILHELMINA GOD ZIJ MET ONS.The second series depicts a slightly smaller portrait of the Queen cut at the neck and not wearing a tiara. The reverse designis identical in both series. It shows a crowned lion bearing a sword and arrows, on a large shield capped with a crown,and the denomination "10 G" on either side. The legend reads KONINGRIJK DER NEDERLANDEN, and the date appears below the shield. There is a seahorse to the left of the date, and a caduceus (a winged staff with two entwined snakes) to the right. The Koninklijke Nederlandse Mint (Royal Dutch Mint) is a company that is entirely the property of the Dutch State. It has its seat in Utrecht, the Netherlands, andsince 1807, it is the only Dutch entity that is allowed to strike and circulate coins. In 1805, under the rule of King Louis Napoleon, the Netherlands decided that the striking and distribution of coins should be the responsibility of a single, national body, as several different coins were circulating within the country bringing issues of bureaucracycontrolling. Originally intended to be established in the capital city of Amsterdam, it was finally decided to locate the National Mint seat in Utrecht, due to the insufficient financial means available. Dutch coins have been made in Utrecht since 1567. As one of the oldest businesses in the country the Royal Dutch Mint is also proud of its long and rich past. The Royal Dutch Mint plays a unique role for taking on the responsibility of the Dutch government with regard to circulation money as well as bullion products, memorial and collection coins and royal medals. The prominent quality of the Royal Dutch Mint is expressed in the high quality of design and manufacturing, promotion and distribution of coins and a full line of products andrelated services. Due to the high quality of manufacturing as well as the exact specifications and the several alternate designs, it would be a very challenging task for any counterfeiter to produce a fake 10 Guilder gold coin. Furthermore, as these coins are quite old and have been in circulation for several years, they bear, almost without exception, scratches and wear marks, which are of course impossible to copy as is the aging patina. As a leading dealer of precious metals products, we are always keen to hear from anybody with bullion coins for sale. If you have any Dutch guilder coins you are looking to cash in on, CoinInvest can offer excellent rates at current market value. Therefore do not hesitate to contact a member of friendly staff who will take the details and prepare a fixed fee offer for you. The offer is for a limited period only and will be confirmed by email.